Freddie said this to me, when I was little. Everyone called my grandmother by her nickname, even my parents, because, as she put it, Freddie, short for Fredrikke was her name. Not Mother, or Grandmother. Just Freddie. Then she asked me if I loved my brother. Violet Whites parents are away and have been for nearly a year. The money they left her and her brother has almost run out and she is desperate for cash. This is why she doesn’t ask questions when 17 year old River West arrives wanting to rent their guesthouse, after all her and her brother are 17 and alone too. When strange etchings start happening around her sleepy town, Echo, though she does start thinking maybe questions should have been asked. Her grandmother, Freddie, always told her to be careful of the Devil, but Violet never though he would be a teenager with a crooked smile who kissed you at night in cemeteries. Now Violet is falling in love and can’t see straight, just the way River likes things to be. But is everything how it seems and can Violet tear herself away from him even if she knows its what needs to happen? Wow, wow, wow. I loved this book. Just when I thought small town US Paranormal YA couldn’t do anything for me anymore along comes Between the Devil and the Deep Blue Sea and completely blows me away. Seriously guys, this book is a must read, and I will be on the look out for any more from the author too! The story is brilliant. I expected it to be a bit more creepy than it started out being but obviously it starts before River arrives and thats when the creepy stuff starts happening. Its obvious that its all something to do with River but his charm and his almost justification for the things going on make him seem like he really does have a heart, he just doesn’t know what to do with it. When you pair the weird stuff with stuff about Violet and her family it all comes together in a really interesting, well plotted piece of fiction and I absolutely loved everywhere it took me. April Genevieve Tucholke is obviously a very talented writer and she does a brilliant job of making you fall for the characters, and creating certain atmospheres within the book. The hairs on my arms stood to attention a few times and I actually nearly cried out for the characters at others. Everything about the book really resonated with me and I could feel for the characters as if they were my friends, I wanted to take little Jack under my wing and I wanted to comfort Violet, I wanted to flirt with Luke and wind Sunshine up in the process and I wanted to be there to beat the crap out of one particular character late on! The thing about the book that really got to me was the paranormal element. I really loved it and I thought it was so well done, so unique. I had never really come across anything like that before and it was creepy because of how unknown it was I think. Also there is nothing really you can do against it, with ghosts you can exercise them, with vampires you can stake them or bring them out into the sun, wolves are harder but a silver bullet gets them off your case. This, I don’t even know what it is, a curse, a gift? It is insane and it takes a lot of talent to pull it off. I won’t go into much detail as I don’t want to spoil anything for anyone who hasn’t read the book but I will say it was incredible learning about it. Between the Devil and the Deep Blue Sea really hit the right spots for me and I really would recommend it. It was the perfect blend of creep with a touch of romance and a bit of lighthearted fun in the form of Sunshine and Luke especially. I am getting annoyed with the amount of series’ there are in YA fiction but if theres a second book coming from April to run alongside this one I will not complain! 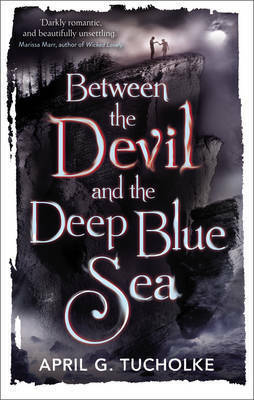 Between the Devil and the Deep Blue Sea will be published on April 3rd by Faber and Faber. My copy was sent to me from the publisher in exchange for an honest review. Wow that was a great review! Defintiely want to read the book now. From the summary it seemed a little bit cliche, but I think I’ll put it on my (mountainous) TBR anyway. Really enjoyed the review and I’ll be keeping an eye out for the book!